Do I need this new GPS watch? Will those shoes provide me with enough support? Will these spandex fight against the ever-so-aggravating chaffing? Would these racing flats boost me to a new PR? Could that running belt come in handy? Will this recovery tool help keep me running strong and pain-free? These are just a few of the questions that many runners ask themselves when it comes to running equipment. With so many new and improved gadgets, shoes, and apparel advertised daily, it’s hard to know what we truly need. Some items are worth the splurge, but some things you’d be better off saving your cash. I tend to be lower-maintenance in the gadgets category. Throughout my years as a competitive runner, I relied on my simple GPS watch to provide me with the information needed during my runs. For me, this included my total time, distance, pace, and mile splits. Although my GPS watch wasn’t anything too fancy, it got the job done! I’m also not too picky when it comes to recovery tools. Honestly, just give me a foam roller and a tennis or golf ball and I’m set! Now, as for the shoes and apparel, I was (and still am) much more high-maintenance. Purchasing tights and running shoes are admittedly my weakness (sorry mom and dad!!) and I continually desire the latest designs/models. While new shoes are actually a necessary purchase due to all of the miles I put on my shoes during recovery runs, hard workouts, and races, the countless spandex and tights were probably not as essential…but I like to pretend that they were. Other accessories, such as hats, running belts, arm bands, headphones, etc. never seemed too crucial for the type of training I was doing. Everyone is different as far as preferences of certain items, usually depending on the type of training they are doing. The shoes that one runner loves may be a shoe that another runner hates. Some runners prefer at watches with a heart rate monitor and all the bells and whistles, while others may want a much more simple watch that provides limited statistics. With that being said, here are my personal favorites and recommendations that can assist those of you who are looking to try something new or who are just starting to run! *NOTE: These are my own preferences and opinions—what works for me may not work for you. Gadgets: My handy dandy Garmin Forerunner 10 watch never failed me! I used it all throughout college during workouts, runs, and races. It wasn’t the fanciest watch on the block, but it did exactly what I needed it to do. 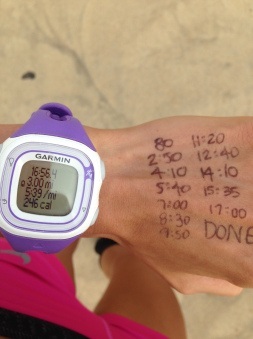 My GPS watch provided information such as pace, time, distance, and mile splits. I am convinced its simplicity is actually what I liked most about it! Just push the “go” button and I was good to go—literally. Many of my teammates had this same watch, as well as newer Garmin version, which has all the upgraded features such as heart rate monitors and step counters. It’s safe to say that Garmin is the brand runners can trust! Shoes: Arguably the most important item a runner owns is their shoes. 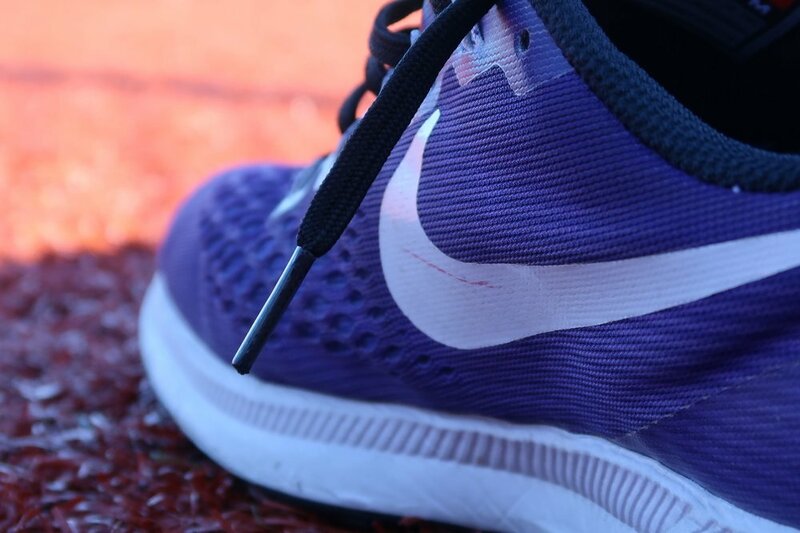 Not having quality running shoes can lead to injuries (A.K.A. a runner’s nightmare!!!) and weeks of cross-training. There are SO many brands, shapes, and sizes to choose from, making it hard to know which will benefit you the most. This is where trial and error comes into play. I recommend going to a specialty running store, such as Luke’s Locker, that will observe your running style and foot strike in order to help you pick the best shoe for your foot. The shoes that have best suited my running style have been the Brooks Launch model. These are a very neutral training shoe that I use on my typical, everyday runs. They provide me with just enough support to keep my feet injury-free, and they aren’t too heavy—which is something I am SUPER picky about. I also have a newfound love for Hoka One One shoes. They rock. While they admittedly look a little similar to those funky-looking Skecher Shape Ups, their level of comfort far surpasses their interesting appearance! Mama always told me, “Don’t judge a book by its cover,” and that 100% applies to these shoes. I wear my Hoka shoes on my long runs and have found them to be super lightweight, while being super supportive. It’s a win-win! *TIP: do not wear your running shoes for other activities, such as walking around and other daily tasks! In fact, according to the International Journal of Athletic Therapy & Training, alternating running shoes and using different shoes for different purposes can reduce collective stresses on the body, reducing the risk of an overuse injury. Apparel: Spandex, tights, sports bras, socks—you name it, I’ve got it. It’s safe to say by the looks of my birthday and Christmas presents over the years that my friends and family have learned the key to my heart! The brand of spandex and tights that I have found to be the highest quality and most reliable for running purposes is Nike. The spandex tends to stay put during runs, which means less chaffing in the Texas heat (#RunnerProblems, am I right?) and the long tights do a great job of keeping me warm during the winter. I’m much less picky when it comes to sports bras and socks, and I have no shame in saying that most of my collection comes from Target. Although running apparel is obviously my weakness, I definitely recommend buying quality tights/spandex/shorts that you feel comfortable wearing because nothing is more aggravating than being uncomfortable during runs. The less to worry about, the better! As I mentioned above, what works for me may not be what works for you, but I hope these recommendations are helpful in educating you of what items are necessary to hit the ground running happy & healthy! Bowles, C., Ambegaonkar, J. P., Cortes, N., & Caswell, S. (2012). Footwear for Distance Runners: The Minimalism Trend. International Journal Of Athletic Therapy & Training, 17(6), 14-18.